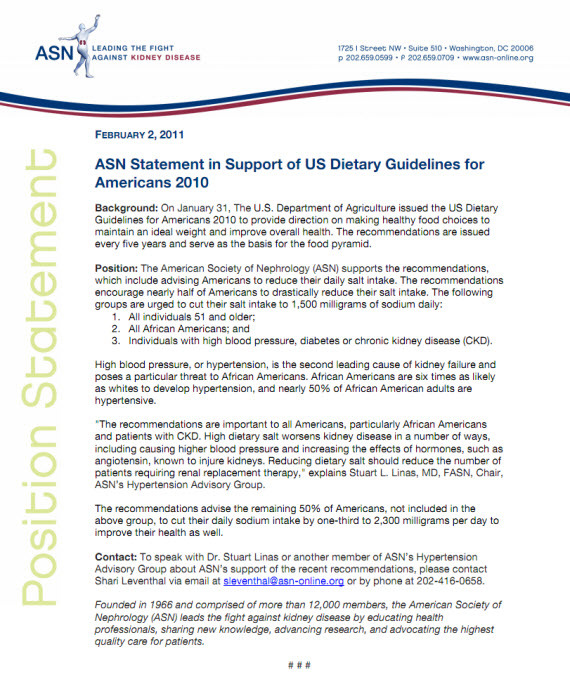 The American Society of Nephrology has just endorsed the Dietary Guidelines issued by the US Department of Agriculture. The ASN is particularly concerned with salt intake. The Society’s complete statement on this issue is appended at the end of this article. 3. Individuals with high blood pressure, diabetes or chronic kidney disease (CKD). improve their health as well. Lets examine these recommendations to see if they make sense. Is it sensible to advise all 300 million Americans to eat a diet containing not more than 2300 mg of sodium (100 mmol)? Is there any dietary recommendation that applies to everyone? The answer is obviously no. Why should anyone reduce salt intake? The reason is that many people are salt sensitive. That is, their blood pressure rises in some proportion to increasing salt consumption and hypertension is the major risk factor for cardiovascular-renal disease. But scores of millions of Americans are salt resistant. No matter how much salt they eat their blood pressure remains normal. Why should they reduce salt intake? Most simply put, is there any scientific evidence that healthy people with blood pressures of 120/80 or less will realize a health benefit by reducing salt intake? The answer is an unequivocal no. In fact, we do not know at what level above 120/80 a health benefit from reducing salt intake starts. It would make far more sense to individualize dietary recommendations based on blood pressure and co-morbidity rather than making blanket recommendations that are not evidence based. One size does not fit all. Why has the world’s leading nephrology society (the ASN) made such sweeping recommendations based on weak science? The first explanation is that passionate true believers are just as common among scientists as they are in any other group. They tend to be assertive and to take over the discussion of the subject to which they are devoted. They are very hard to resist. Another reason is that professional societies are reluctant to oppose advisories issued by the government – in this case the USDA. They are actually under great pressure to endorse such recommendations. For whatever reason these three recommendations do not appear to me to have been seriously thought out. Of the three suggestions above, the first is the most risible. As stated already, there is no reason for healthy normotensive people to reduce salt intake. Far better they check their blood pressure from time to time and adjust salt intake when there is a reason to do so. The second is on a little firmer ground. The incidence of salt sensitive hypertension in African-Americans is very high – perhaps as high as 50%. Is this a good reason for the remaining half to likewise restrict salt intake? Again, why not just measure blood pressure? The third recommendation seems the most reasonable. Most of these patients will be hypertensive and benefit from salt reduction. But it’s not known whether the occasional patient who has CKD or diabetes and who has a normal blood pressure benefits from salt reduction. Let’s consider the degree of salt restriction advised. 1500 mg of sodium per day, 65 mmol, requires a diet that most people find unpalatable and which is almost impossible to achieve regardless of how forceful the exhortation devoted to it. For many the unsalted life is not worth living. 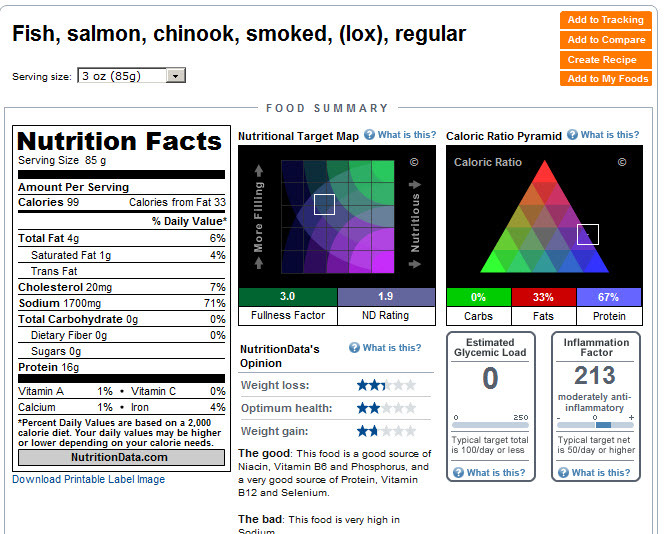 One 3 ounce serving of lox contains 1700 mg of sodium. Irrespective of the value used in these recommendations (and I don’t think much of them) the vast majority of Americans will disregard them. So what comes next? In Mayor Bloomberg’s New York can regulations be far behind? Trans fats were banned in New York with less evidence of their harm than that which attaches to salt. As a matter of fact a New York Assemblyman Felix Ortiz has already introduced a bill which would ban salt in New York restaurants. The 2300 mg (100 mmol) per day of salt intake allowed for healthy people under 51 also will be difficult to achieve. This requires eschewing the salt shaker and forgoing food high in salt. You might wish to reflect on the Japanese. They simultaneously have the world’s highest salt intake and the longest life expectancy. Take all of this business with a grain of salt. You should reduce dietary salt intake if your blood pressure is high normal or above, if you have heart or renal disease, and if you have liver disease associated with edema and or ascites. But you should do so under the supervision of a physician. You will likely be unable get below 100 mmol per day without making your life miserable. There also is no evidence that the 65 mmol daily recommended by the ASN is any better than 100 mmol. These recommendations are another example of confusing intention with outcome. The sensible to be buried by fanatic control freaks. It has taken me a long time to stop being generous about such people and realize that bugaboos are invented for the sake of control (and/or money), not necessarily, to benefit anyone. Similar lack of reasoning abounds everywhere. Often causing great harm, and no good. Just one anecdote. My tiny English mother-in-law used 3 heaping tablespoons of salt on every meal. She swam in the ocean frequently and died at 88….from anesthesia for an eye operation…so we were told.. Thank you for remindung us of this wise statement. Urged by a health-conscious friend about five years ago, I greatly reduced my salt intake, and nothing changed. Before, my blood pressure used to be around 120/90. Now it is 130/80. Being 71, I suppose I should not complain. I love putting herb salt generously on my “bratkartoffeln” (potatoes, previously boiled, fried in butter).